Capt. 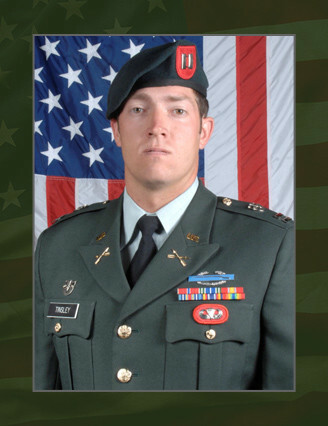 John Tinsley, 28, was killed Aug. 12, 2009, while conducting a mounted patrol in the Oruzgan Province, Afghanistan, in support of combat operations while serving with Company B, 2nd Battalion, 7th Special Forces Group (Airborne). He deployed in support of Operation Enduring Freedom in July 2009 as a member of the Combined Joint Special Operations Task Force – Afghanistan. This was his third deployment in support of the Global War on Terror and first deployment to Afghanistan. He was a Special Forces Operational Detachment- Alpha team commander. Tinsley was a native of New Jersey, and was commissioned in August 2002 after graduation from Florida State University, Tallahassee, Fla. He was assigned to the 1st Bn., 12th Infantry Regiment, 4th Infantry Division at Fort Carson, Colo. He was then later assigned to the 1st Bn., 3rd Infantry Regt., at Fort Myer, Va. as a member of the “Old Guard” in 2004. In 2006 he was deployed to Iraq as a member of Multi-National Corps-Iraq. He began the Special Forces Qualifications Course January 2007 and earning the coveted “Green Beret” in January 2009. Tinsley’s military education includes the Bradley Infantry Fighting Vehicle Commander’s Course, Infantry Officer Basic Course, Survival, Evasion, Resistance and Escape Course, Basic Airborne Course, Ranger Course, and Special Forces Qualification Course. His awards and decorations include the Bronze Star Medal, Purple Heart Medal, Meritorious Service Medal, Army Commendation Medals, Army Achievement Medal, National Defense Service Medal, Afghanistan Campaign Medal, Iraq Campaign Medal, National Defense Service Medal, Global War on Terrorism Expeditionary Medal, Global War on Terrorism Service Medal, Afghanistan Campaign Medal, Army Service Ribbon, Overseas Service Medal, Combat Infantryman Badge, Parachutist Badge, Ranger Tab and the Special Forces Tab. Tinsley is survived by his wife, Emily, and daughter, Isabella, of Fayetteville, N.C.; mother Debra, and father John Tinsley, of Jacksonville, Fla.